Cut Bank International Airport is the only 24/7 U.S. Customs facility in the area. 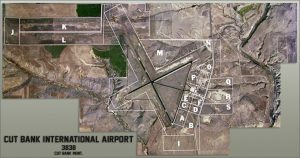 Did you know there's land for lease from the Airport? Radio operators from 1940 till now are operating the waves of our communication. Montana is a place like no other, and Cut Bank is right in the middle of it. Join us August 19-21 this year of 2016 for the area's biggest Blast! Cut Bank International Airport is a perfect place to stop for 24/7 U.S. Customs clearance (the only 24/7 U.S. Customs Facility in the area), refueling, repairs or, as a destination for Glacier National Park, The Bob Marshall Wilderness, Canada and Alaska. We are close to several back-woods grass airstrips where you can enjoy a weekend or your entire vacation. Sleeping and shower accommodations are available plus free courtesy vehicles for your visit to Cut Bank and the vicinity—not to mention the World War II Airmen’s Memorial Museum at the airport. Self-service fuel is also available at any time with single point capability. Make the airport your destination no matter what the season or the reason. Historically, the airport was a World War II Air Base used for training B-17 crews and the original B-17 hangar is still in regular use. In 2007, the Cut Bank Airport was listed on the National Registry of Historic Places. Take a closer look at the conditions at the Cut Bank International Airport. Multiple camera perspectives show the overall ramp views, grounds and facilities. Cut Bank International Airport is the only 24/7 U.S. Customs facility in the area. Self-service fuel is also available at any time with single point capability, as well as other services. Enjoy access to fuel, charts, mechanics, pilot lounge, fax/copy machine, hangar rentals, camping, free WiFi, customs processing, rental cars and more. The Cut Bank Airport has a long history in Cut Bank Montana, and has won "Airport of the Year." The facilities were constructed in 1941 for U.S.A. B-17 Bomber Training, and today, host a variety of community events including the local "Montana Fun Weekend" and various other Air Shows and event automobile shows.